We stock many parts for the Do-It-Yourselfer. For garage door repair we stock springs, track, cables, hinges, rollers and much more. For garage door operator repair we stock gears, photo eyes, logic boards, travelers, transmitters, keyless entries and many more parts for most garage door operator brands including Raynor, Chamberlain, Liftmaster, Sears, Clopay, Amarr, Genie, Stanley, Multi-Code, Linear, Allstar, Pulsar, Ideal, & Moore-O-Matic. Visit our parts department or call us at (651) 490-1599 for parts availability. Our technicians are trained and our trucks are equipped to repair any problems with your garage door and opener. 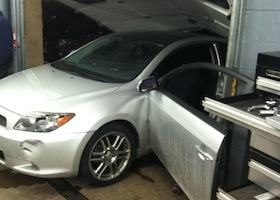 We repair or replace broken springs, cables, tracks, rollers, hinges, door panels and sections. 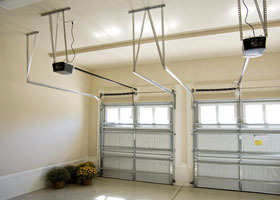 We can repair most major brands of garage door openers. We also offer fast, same-day service. Our telephone is answered 24 hours each day and we service the entire 7 county metropolitan area. We provide repairs on overhead sectional doors, coiling steel doors, and rolling counter shutters. We have the proper equipment and parts to repair the largest of industrial doors. When a home gets damaged or destroyed from a storm or other natural disaster, we are here to help. 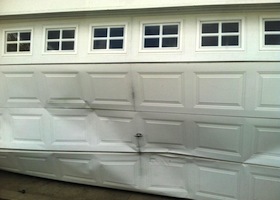 We’ll work with a contractor and/or insurance company to get the garage door replaced quickly.